Two rounds have been completed in the US and now the paddock has flown to Europe to one of the most beautiful tracks in the world, Circuit de Spa-Francorchamps. This lovely circuit in the Ardennes has one of the most famous corner in the world, Eau Rouge. A lot of drivers of the NES, and in real life, love this track and want to perform well here. New to the NES grid is United SportsCar SimRacing after Friction Racing had to withdraw their second entry, due to lack of drivers. Everybody in the paddock is happy that USCSR joins the NES for the remainder of the season. In the standings it is Coanda Simsport leading in Prototype class right now, thanks to consistent finishes so far. Radicals Online wants to redeem themselves at Spa after their DNF at COTA. Keep an eye on Apex Racing UK, Friction Racing and Twisted Apex Racing, these teams can come out of nowhere at the end of the race. In GT class Fenix Motorsport leads in points after their win at COTA. Can they keep the momentum going? New World Sim Sport wants to take that top position back. Second in points it is Apex Racing UK. Car 34 is showing great speed and consistency. The drivers from iRacingDenmark Assault Racing are still looking for their first victory. The Dart Frogs are leading GTC at the moment, thanks to their great consistent podium finishes. Vergil Racing had a lot of trouble at COTA, but are looking to rebound at Spa-Francorchamps. SRN Motorsports is also in the middle of the championship battle thanks to consistent finishes. SuperSport Racing missed the first race, but are still fourth in points thanks to their win at COTA. Teams have to watch out for SuperSport Racing. Behind the points leader in GTC it is very close. Second and third are tied at 59. Fourth and fifth too, with 50 points and sixth and seventh have both 32 points. 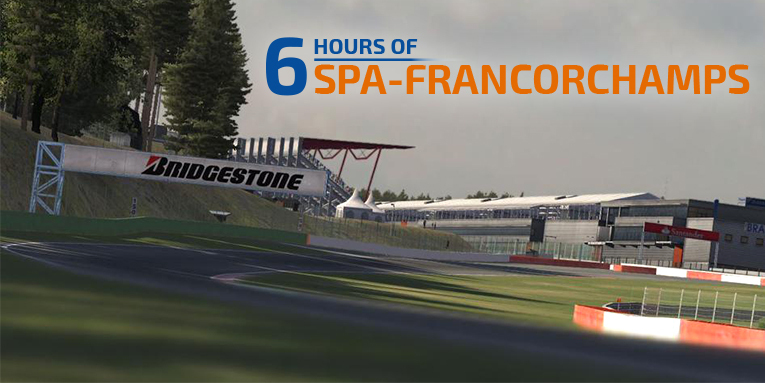 The 6 Hours of Spa-Francorchamps starts on Sunday January 18th at 14:00 GMT. Take a look at the entry list for a detailed overview of the teams and drivers. Don’t forget the spotters guide, made by Niel Hekkens (USCSR is not on it yet).